Before you start creating a custom layout manager, make sure that no existing layout manager meets your requirements. In particular, layout managers such as GridBagLayout, SpringLayout, and BoxLayout are flexible enough to work in many cases. You can also find layout managers from other sources, such as from the Internet. Finally, you can simplify layout by grouping components into containers such as panels. To create a custom layout manager, you must create a class that implements the LayoutManager interface. You can either implement it directly, or implement its subinterface, LayoutManager2. Called by the Container class's add methods. Layout managers that do not associate strings with their components generally do nothing in this method. Called by the Container methods remove and removeAll. Layout managers override this method to clear an internal state they may have associated with the Component. Called by the Container class's getPreferredSize method, which is itself called under a variety of circumstances. This method should calculate and return the ideal size of the container, assuming that the components it contains will be at or above their preferred sizes. This method must take into account the container's internal borders, which are returned by the getInsets method. Called by the Container getMinimumSize method, which is itself called under a variety of circumstances. This method should calculate and return the minimum size of the container, assuming that the components it contains will be at or above their minimum sizes. This method must take into account the container's internal borders, which are returned by the getInsets method. Called to position and size each of the components in the container. A layout manager's layoutContainer method does not actually draw components. It simply invokes one or more of each component's setSize, setLocation, and setBounds methods to set the component's size and position. This method must take into account the container's internal borders, which are returned by the getInsets method. If appropriate, it should also take the container's orientation (returned by the getComponentOrientation method) into account. You cannot assume that the preferredLayoutSize or minimumLayoutSize methods will be called before layoutContainer is called. Besides implementing the preceding five methods, layout managers generally implement at least one public constructor and the toString method. Of these methods, the most important are addLayoutComponent(Component, Object) and invalidateLayout(Container). The addLayoutComponent method is used to add components to the layout, using the specified constraint object. The invalidateLayout method is used to invalidate the layout, so that if the layout manager has cached information, this should be discarded. For more information about LayoutManager2, see the LayoutManager2 API documentation. Finally, whenever you create custom layout managers, you should be careful of keeping references to Component instances that are no longer children of the Container. Namely, layout managers should override removeLayoutComponent to clear any cached state related to the Component. The example CustomLayoutDemo uses a custom layout manager called DiagonalLayout. You can find the layout manager's source code in DiagonalLayout.java. DialogLayout lays out components diagonally, from left to right, with one component per row. 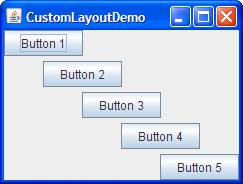 Here is a picture of CustomLayoutDemo using DialogLayout to lay out five buttons. Click the Launch button to run CustomLayoutDemo using Java™ Web Start (download JDK 7 or later). Alternatively, to compile and run the example yourself, consult the example index.